Most of the Remotes used in our home appliances are based on IR (INFRARED). INFRARED rays are a part of Frequency Spectrum, in which they lies just below the visible light. So we can't be able to see them with our naked eyes. If you wants to see an INFRARED ray, just press and hold a button on your tv remote and point its led to a camera and you can see the ray on screen. I think you already know that. It is quite easy to control an appliance with a remote, isn't it.....? Yeah. And It is not a difficult task to make an appliance controlled by a remote. 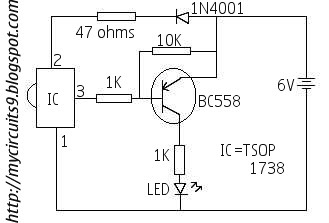 The main part of this circuit is IR sensor TSOP 1738. TSOP IR sensor is a three Terminal device its pin configuration is shown in the figure. The output pin (3) goes low when it receives sufficient amount of IR rays. 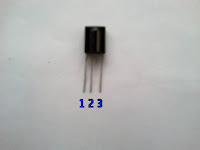 This decrease in output voltage is fed to the input (base) of the PNP transistor BC558, it is replacable with any PNP transistor. The PNP transistor will increase its output while its Input goes low. This output voltage from the collector is given directly to an LED with the help of a current limiting resistor. This circuit works finely on any common remotes in your home (38Khz). 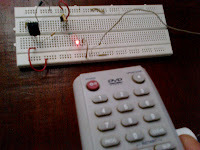 Point the remote to TSOP 1738 sensor with correct line of sight and press any button of your remote. The LED will glow!! To get best results point the remote on any sides of TSOP Sensor. the LED will Switch ON while i'm pressing the button and switch OFF after i release the button ?? i will Switch ON after pressing the button and stay ON after i release the button then if i want to switch the LED OFF i should press any button again ?? can you help me find a circuit keep the LED ON and can be switched OFF by pressing any button again ?! is there a way to make it only respond to a certain button like the power button? Mr. Joseph, this switch ain't working. I don't know why. Please help. Any 6v battery wasn't available so i've made a 4.5 v battery from 3 pencil cells, since the operating range of TSOP1738 is 4.5-5.5V. Please help ASAP. Also explain connection of BC558, so that i can check if I've made any fault. Thank a lot. If you don't have a 6V battery, use a voltage source (cells)which is above 6V and nearer to it. Try this change and comment here. @TITTU THOMASFinally its working thank u tittu. Can you please tell me what to do so that i can use a motor instead of an LED in the ckt. because the motor isnt working but a buzzer and an LED are working fine. My circuit is not working please advice. I tested the IR sensor alone and its working perfectly. Point the IR Led to the TSOP sensor and check its output pin whether it reduces the voltage with respect to ground by using a multimeter. I tested the output pin with resp3ct to ground. The voltage decreases by only 0.9 V or so. Please advice. Now, check the output voltage at collector terminal of Transistor BC558. Sir, I measured 0.3 V across the collector. still not working. Is it possible that the reason is because I am not using the same IR sensor. I am using another IR sensor. You must use the same IR sensor as Specified in the circuit. can i used that circuit if i need a switch on and off for two motors that works independently? Is the remote switch is suitable for controlling fan speed and light.